Summertime means fun in the sun, camps for the kids, time at the beach, and 50 million other things going on. During this busy, fun time, dinner needs to be quick and easy and should not require much time standing over the stove. 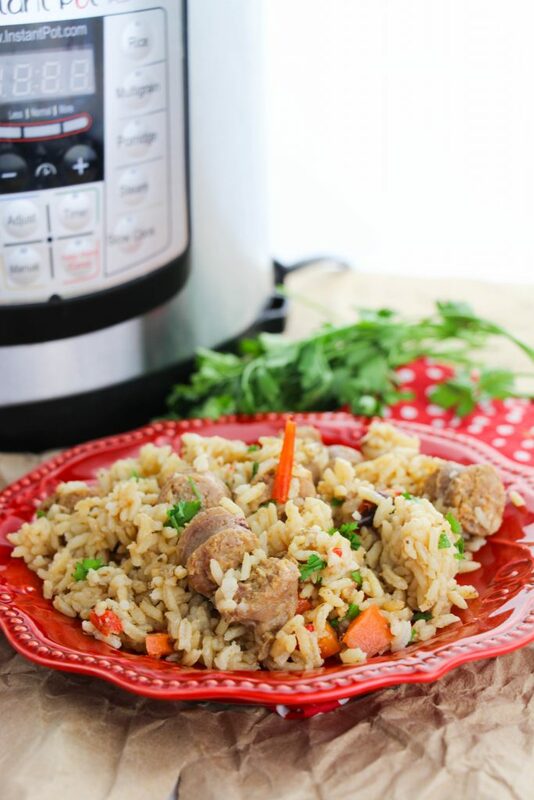 If you are looking for a quick and easy dinner to fit your busy summer schedule, look no further than the Instant Pot Cajun Sausage and Rice! Have you joined the Instant Pot craze? I have had one for about a year and a half and it has become one of my most used kitchen appliances. If you are still wondering what an Instant Pot is, it is a brand name electric pressure cooker. Not only does it pressure cook, but it also functions as a slow cooker, yogurt maker (depending on the model), rice cooker, and steamer. It is a one-pot wonder! I was always that person that would forget to put meals in the slow cooker in time, so the Instant Pot is a great fit for me because it cooks everything so quickly. If you have yet to check out the Instant Pot, you can see it here on Amazon (affiliate link). 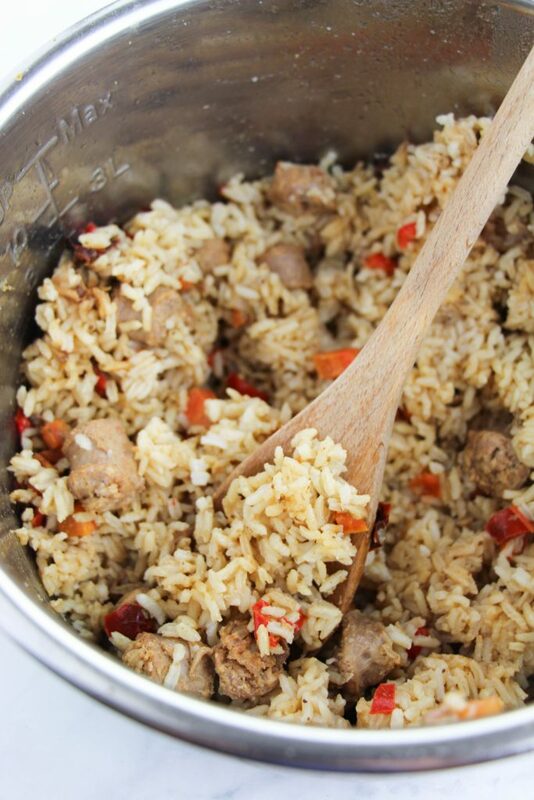 The Instant Pot Cajun Sausage and Rice is a great recipe to christen that Instant Pot you still have sitting in the box (you know who you are, those that have been too scared to start using it because you are not sure what to do with it). To begin, grab your Instant Pot and remove the lid. Place 2 Tablespoons of oil in the Instant Pot and set it to sauté. 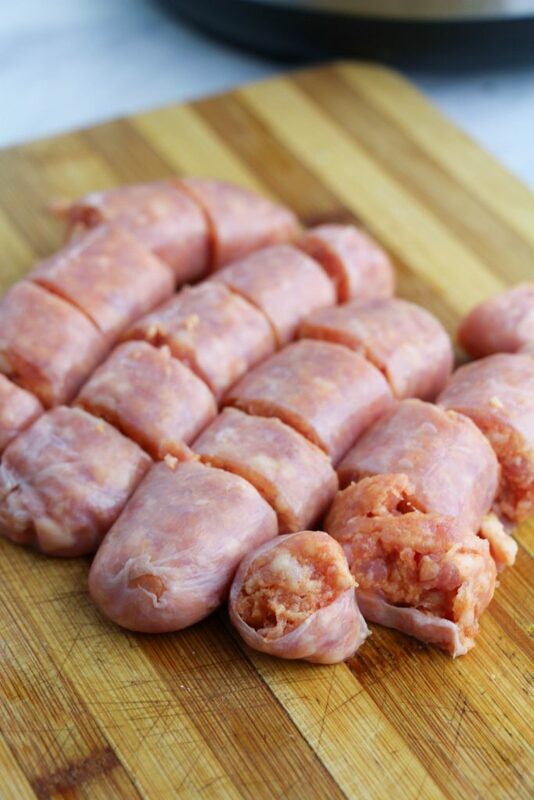 While it is heating up, cut the sausages into slices. When the Instant Pot says “hot”, it is ready to go. Now add the sausages and cook until browned. 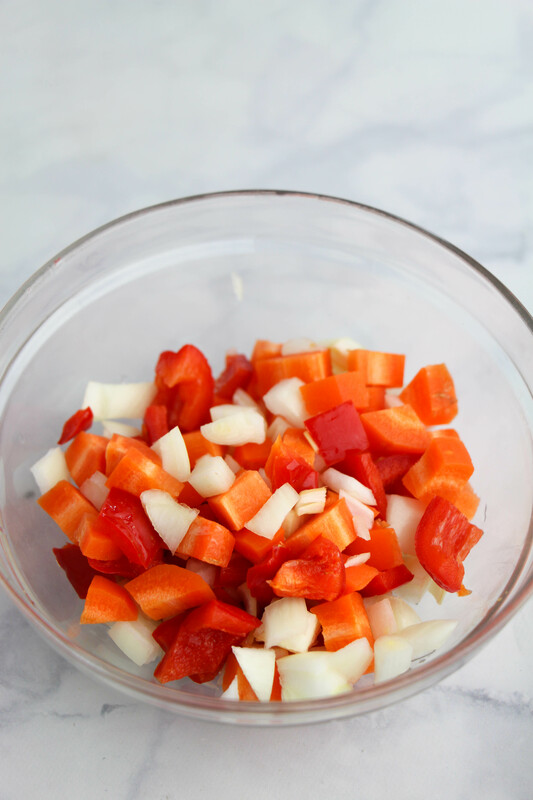 While that is browning, dice up the red bell pepper, carrots, and onion. Once the sausage is ready, add the veggies you just chopped and cook until they are soft. If your Instant Pot gets too hot, you can change the temperature setting by pressing the cancel button, then sauté, and the “adjust” button. From there you can adjust the temperature from less, to normal, to more. 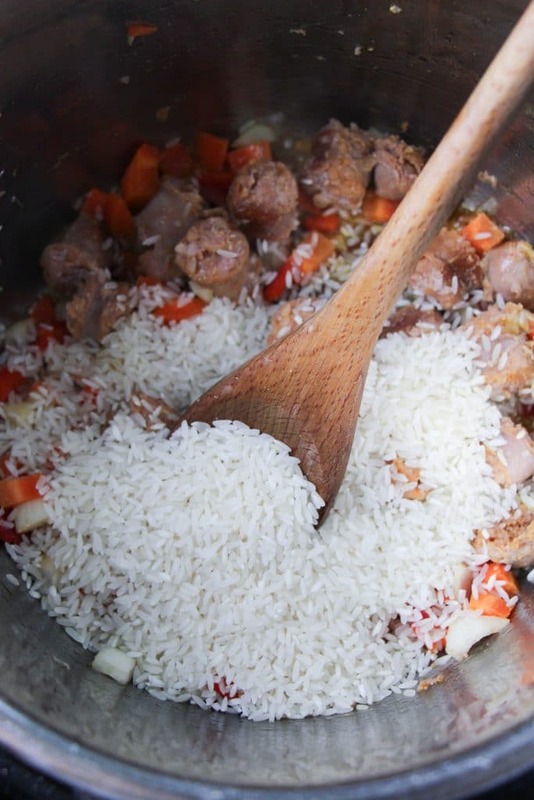 Normal would be a good setting for this Instant Pot Cajun Sausage and Rice recipe. Now that the veggies are nice and soft, turn off the Instant Pot by pressing cancel. Now it is time to add the rice, broth, and seasoning. Give it a good stir and to let your Instant Pot do its pressure cooking magic. Seriously, whoever invented the pressure cooker was a genius! Secure the lid on the Instant Pot by putting it on and turning it clockwise until it locks into place. Make sure the steam release valve is set to “sealing”; if the knob is set to venting the pot will never come to pressure. 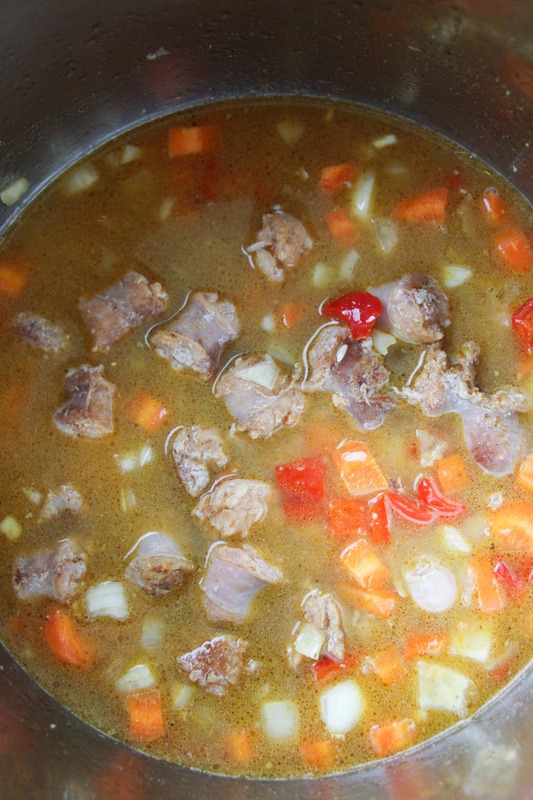 Select “stew/meat” setting and adjust the time to 5 minutes by pressing the “+” or “-“ buttons. The Instant Pot will beep three times to let you know that it is starting the process. When the time is up, be a little patient and let it natural release. When the pot has depressurized, the float valve (the silver button-looking thing beside the seal valve) will drop. Open the lid and voilá: you have Cajun Sausage and Rice and it only took one pot and little bit of time! Serve and garnish with some chopped parsley. Print out the recipe below and give it a try! Place oil in Instant Pot on sauté setting. 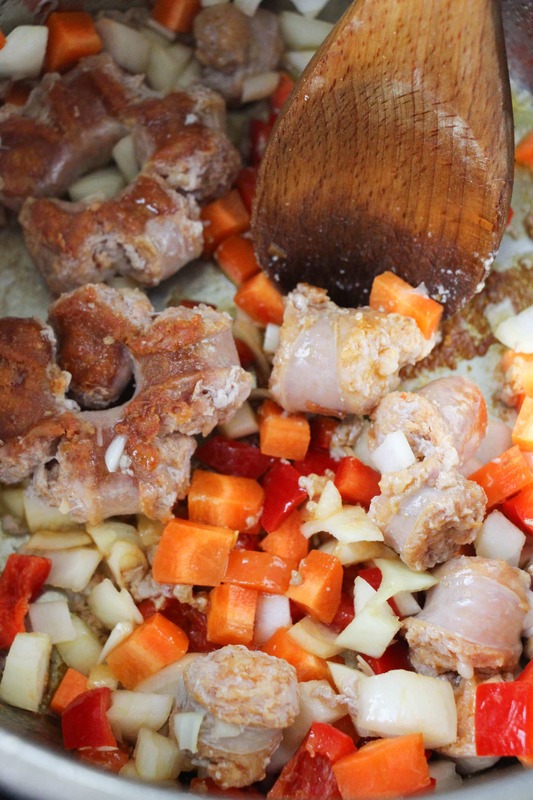 Add the oil and allow to heat as you chop up the sausages. 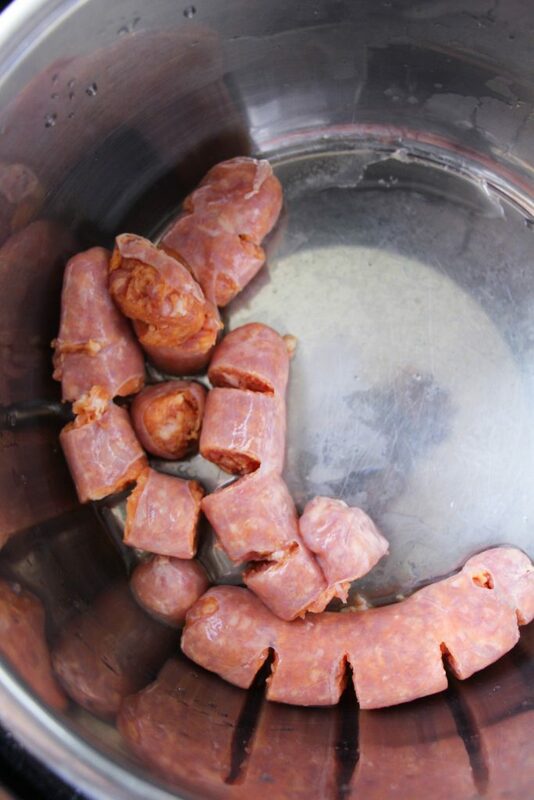 Add the sausage to the Instant Pot and cook until browned. Add the vegetables and sauté until soft. Add the rice, broth and seasoning. Stir ingredients together and secure the Instant Pot lid. Select “stew/meat” setting for 5 minutes. Check out other time saving recipes by subscribing to one of our 5 Dinners in 1 Hour meal plans here. You can have dinner on the table every night without the mess and stress!